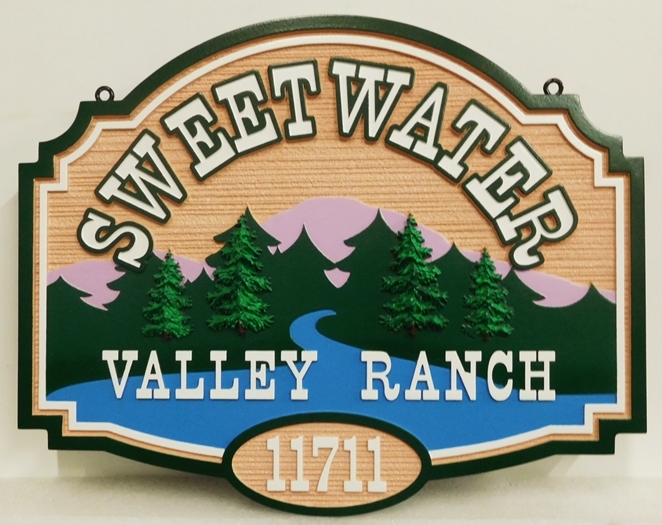 Above is a photo of a property name sign "Sweetwater Ranch"" that features a stylized scene of a mountains, a river and lake, and a forest. Four depths of 2.5-D flat relief have been carved into the HDU material . The outer border, text, and scene are elevated at various levels above the sandblasted sky background , which has a wood grain texture. Four of the pine trees are carved in 3-D bas-relief, and mounted on the sign as appliques. After painting by an artist, the sign is clear-coated twice for additional UV and weather protection. This sign can be mounted on a door, an adjacent wall, a gate, on a metal or wood post, or hung from a wood or iron hanger. Please click on one of the numbered light gray boxes on the lower left margin of this page to see a few more of our 45 Photo Galleries, which have a total of over 8000 photos. Other related Galleries include Gallery 23, 16, 18, 19 and 20. For farm and ranch signs, many of which also have artwork of wild animals and mountain & forest scenes, click on Gallery 23 - Ranch & Farm Signs. You can click on Home to see our home page. Please click on one of the numbered light gray boxes on the lower left margin of this page to see other Photo Galleries, or use the navigation dark gray tabs at the top, or the gray boxes on the upper left margin to see other information such as prices, order forms, testimonials, etc.